I guess it's pretty obvious that I am a massive fan of beauty blogs, I spend hours on end checking out all these lovely sites on the web, reading about new releases or the nicest way to apply your foundation. While my Bloglovin feeds get filled by over two hundred blogs, there are a few blogs that I never miss a single post from. And in this post I line them up. 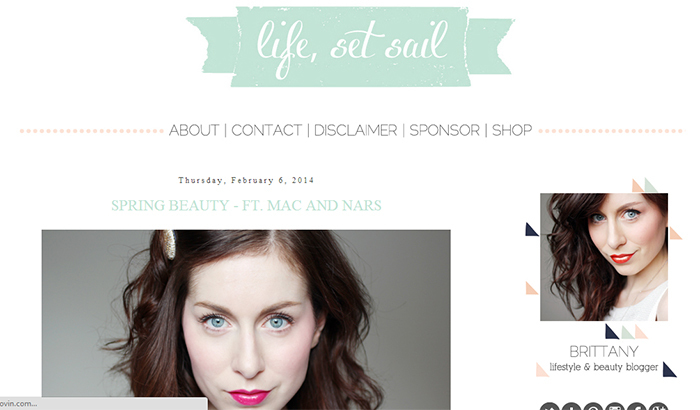 First up is Life, Set Sail by the wonderful Brittany. I found this blog through the ever so wonderful Sunday Beauty Bloggers link share on Twitter, and I fell in love at first sight. First of all, Brittany is gorgeous and super sweet. The content and photos she shares on her blog are always of great quality and I can't stay away. Her reviews are clear and to the point and she features some great products in her favorites. Long story short, you should definitely be reading Life, Set Sail. 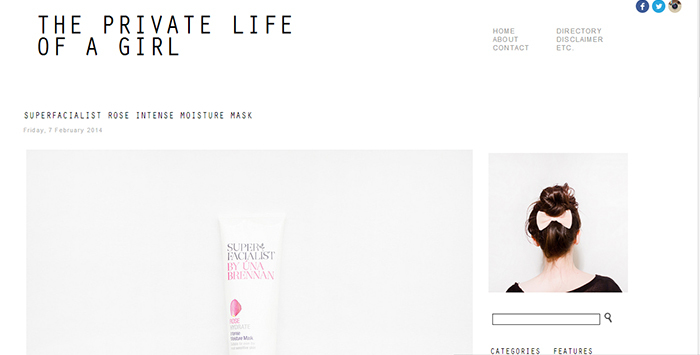 Sophie writes the gorgeous blog Private Life of a Girl. 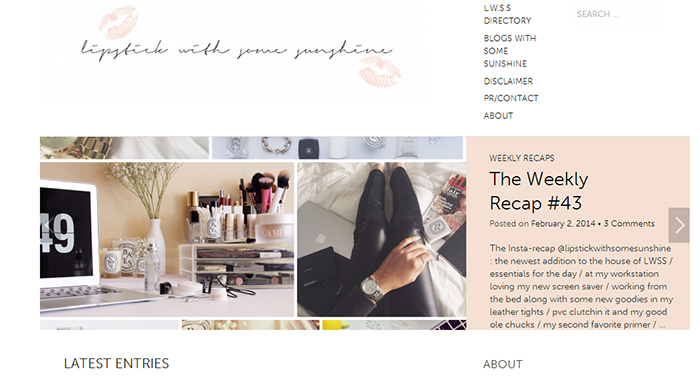 What lured me in to her blog was the positively gorgeous minimalistic approach she takes to everything. Her photos are super clean and bright, just like her blog layout. But when you start reading it gets even better. She writes incredible reviews, detailed and honest and you never feel like you're being tricked into reading an advert, like some blogs do. When I see that she is loving something you can bet your bottom dollar I'm considering getting it as well. Alexandra is a gorgeous blonde from Canada, who has a beautiful blog that features some amazing beauty and lifestyle posts. Her reviews are very honest and detailed, which I love. The pictures of her swatches are really clear, which is always a pro in my book. I really like the yearly favorites round she did when this year started, and she even convinced me to purchase the Estee Lauder Advanced Night Repair which has drasticcally improved the quality of my skin. Plus she's also really nice and relatable, so you should definitely follow her on Twitter and Instagram as well. Last up is Lipstick With Some Sunshine, written by Tamira. I've got some serious eyebrow envy, I'm telling you. Her compositions are beautiful and she really knows how to put stuff on people's wishlists. She has a serious love for Diptyque and acrylic storage. I recommend checking out the post she did on her latest Tom Ford purchase for I can guarantee you'll want to add that shade to your collection. 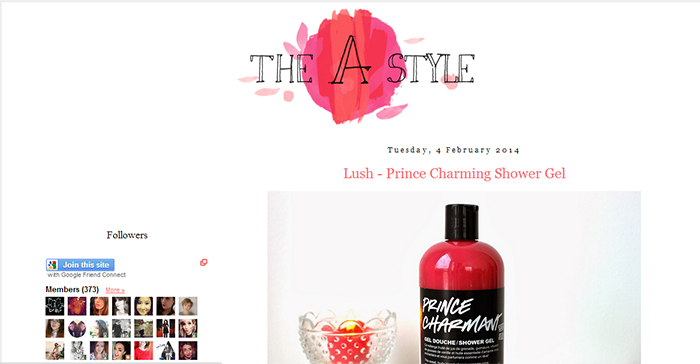 She's beautiful and so is her blog, and I can recommend it to everyone.